For several years, the seminarians of the Archdiocese of Indianapolis have gone on a pilgrimage together shortly before they return to their seminaries for another year of priestly formation. They have usually traveled to historic churches or shrines in the archdiocese to pray at places where some of the first Catholics in central and southern Indiana came to worship. This year, archdiocesan vocations director Father Eric Johnson instead arranged for the seminarians to visit a number of programs operated by Catholic Charities Indianapolis. Archbishop Buechlein reflected on the connection of priestly ministry and the work of charity after the seminarians heard a presentation on Catholic Charities Indianapolis’ Refugee Resettlement program. Joseph Trimble, who became an archdiocesan seminarian earlier this year, was interested in learning about how the local Church helps refugees from around the world start a new life in central Indiana. He had been involved in a variety of charitable ministries in Maryland, where he taught at Catholic high schools for many years. Trimble, who was an archdiocesan seminarian in the 1980s, is a member of the Fourth Theology class at Saint Meinrad Seminary and School of Theology in St. Meinrad. He expects to be ordained a transitional deacon in the spring of 2011. Earlier in the day, when the seminarians were visiting Catholic Charities Indianapolis’ Crisis Office and Christmas Store, Father Johnson spoke about the importance of the seminarians learning about the way the mission of charity at times goes beyond what happens at the parish level. Seminarian Vincent Jansen, a member of Our Lady of the Greenwood Parish in Greenwood, became familiar with these ministries through volunteering at the Christmas Store. He said that experience and volunteering at The Lord’s Pantry in Indianapolis aided him in his vocational discernment. Jansen is a freshman at Bishop Simon Bruté College Seminary in Indianapolis. Stephanie Davis, the director of the Crisis Office and Christmas Store, was glad to tell the seminarians about the ministries that she oversees. While learning about the specific ways that the archdiocese ministers to those in need in central and southern Indiana was helpful to seminarian Daniel Bedel, he was also aware that being personally active in it will be important as a priest. “When [Jesus] was on this Earth, he was out healing people,” said Bedel, a member of St. John the Evangelist Parish in Enochsburg. “He was out ministering to the poor and to those in need. He came to heal the sick, not to heal those who were healthy. After having lunch at the rectory of SS. Peter and Paul Cathedral in Indianapolis, the seminarians visited the new Holy Family Shelter on the grounds of Holy Trinity Parish on the west side of Indianapolis. Now in its 25th year of ministering to homeless families, Holy Family Shelter moved into its new facility last December. 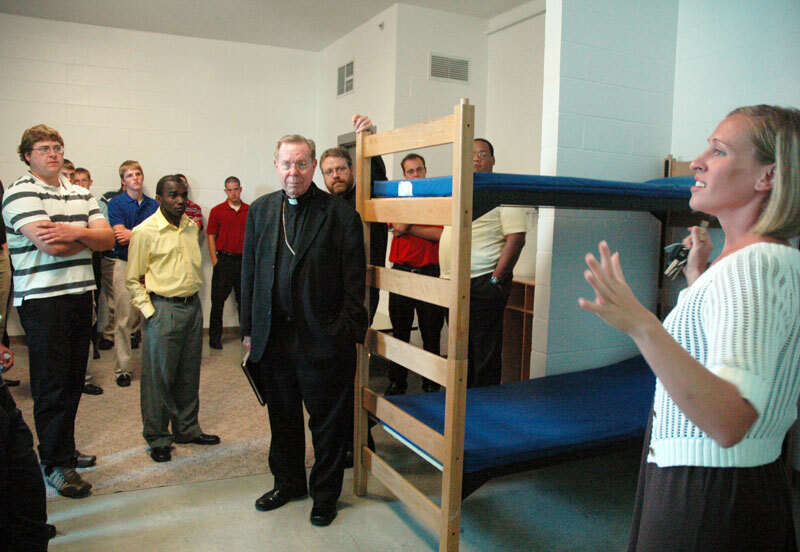 Emily Able, the shelter’s director of community and youth services, gave the seminarians a tour of the facility. She said that she always enjoys showing groups of people the facilities at Holy Family Shelter. 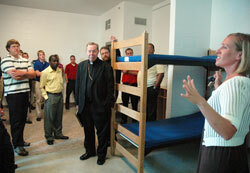 Showing the shelter to the seminarians, though, took that enjoyment to another level. “Who they are and the fact that they may one day have congregations to work with makes it even more relevant,” Able said. After visiting Holy Family Shelter, the seminarians went to Mass at the adjacent Holy Trinity Church. Archbishop Buechlein was the principal celebrant of the liturgy. Their visits ended at St. Elizabeth/Coleman Pregnancy and Adoption Services on the south side of Indianapolis. There, the seminarians learned about the way this Catholic Charities Indianapolis program helps women in crisis pregnancies and facilitates adoptions.